Lemon Balm (Melissa officinalis) is an herbal nervine. A nervine is an herb that works on helping the nervous system combat stress and nervous exhaustion. Lemon balm is calming and soothes the nerves. It helps the body to naturally relax. Lemon balm contains active herbal ingredients that act as an antispasmodic. Antispasmodics are used to relax smooth muscle tissues in the body. Lemon balm tea makes a wonderful bed time tea for adults or children. Due it’s natural chemicals, having a cup of lemon balm tea before bed can lull you into a beneficial nights sleep. In order to have more energy, one must get a good nights sleep. It is good as a single herb for anxiety and stress, but can also be used in combination with other calming herbs such as Valerian, Catnip, Lavender, or Passionflower. If mixed with Valerian or Passionflower, you should not use any other sleep inducing medication such as Valium. For anxiety, it works best to take 3-4 cups per day for 2 weeks to allow the lemon balm to take effect. Remember that herbs can be medicinal and you should contact an expert with any questions about interactions. A lemon balm tea is an infusion using water and is very easy to make. Use 1 tsp per 8 oz of water. Heat enough water to make one cup (coffee cup size). Place lemon balm herb into tea strainer. Pour hot water over herb. Place small saucer plate over cup to retain essential oils of the herb in the cup. Add honey for sweetness and stir. Sit back, relax and enjoy your delicious lemon balm tea. A coffee or tea press can be used to make the lemon balm tea. For a restful nights sleep, drink about one hour before bed. Lemon balm is easy to grow, and makes a nice addition to any garden. It’s light green leaves look great against dark foliage in your garden. It actually makes the leaves look like glow. Pick the flowers before it flowers. You can use them fresh, or dry them for later use. Once it flowers, it will attract bee’s and butterflies to your garden. You can grow it for it’s beauty, for it’s medicinal purpose, or just as a pot herb. For whatever reason you grow Lemon Balm, you can’t go wrong. Can’t wait for it to grow? 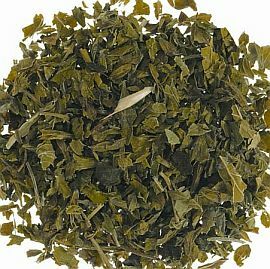 Order organic lemon balm tea online. Herbal remedies are not always instant. It may take a few days for the lemon balm tea to take effect. Herbs work at a cellular level, so give it time. Using more lemon balm does not equal faster or better results. Lemon balm should not be used by those taking thyroid medication. It can interfere with it’s absorption.